Make This Martial Arts Video Series an Important part of YOUR Training! and Become a Modern Warrior! WCI's flagship video is a two-DVD set that presents the secrets shared by Bujinkan Ninja Teachers Shidoshi Jeffrey M. Miller, J. Courtland Elliott, and Greg Tremblay during WCI's annual Spring Ninja Training Camp in march of 2004. And now, for a limited time, you can get a copy for yourself - FREE! 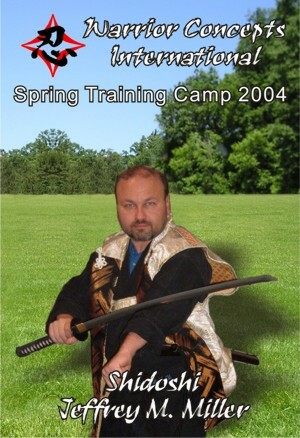 WCI's special yearly Spring and Fall Ninja Camps were designed as a way to re-create the feelings, fellowship, and intensity of the training offered in the early days of Ninjutsu here in North America. Many practitioners miss the days when we trained from sun-up to well-past sundown, and went to bed tired and happy. Only to get up and do it all over again the next day! The theme of Spring Ninja Training Camp 2004 is Developing The Tatsujin" - 'the human being developed to his or her fullest potential.' On this special 2-DVD collection, you will gain tremendous insights and knowledge into the secrets of Ninja mastery from senior Bujinkan teachers, Shidoshi Jeffrey Miller, and guest instructors, Shidoshi J. Courtland Elliott, Shidoshi Greg Tremblay, and others. ...to enhance your overall training while allowing you to identify those areas of your life that are "out-of-balance" with everything else. Thinking "outside-the-box" - like a Ninja! With over two decades of experience each, these martial arts professionals presented an unforgettable weekend for all in attendance. And now, you can get the same lessons, secrets, and life changing philosophy, even if you didn't make it to the actual event. The cost of a full weekend of camp is $1,200.00US. But, you won't pay that for this 2-DVD set. In fact you won't pay the $297 it was produced to be sold at either. In fact, you're not going to pay $197, $150, or even $97 to get this knowledge. During this special promotion where I want you to see what brings students from all over the world to train at my annual Ninja training camps, the only cost to own Spring Ninja Training Camp 2004 is just the cost of shipping and handling to get it to your door. For just $9.95 for US addresses and $12 for Int'l shipping, you can have this powerful 2-DVD set. That's a savings of $297! All you have to do is click on the order link under the DVD at the top right side of the page and tell me where to ship your free ninjutsu video dvd.